Since the beginning, Xdesk has been dedicated to giving customers the opportunity to fully personalize their desk. 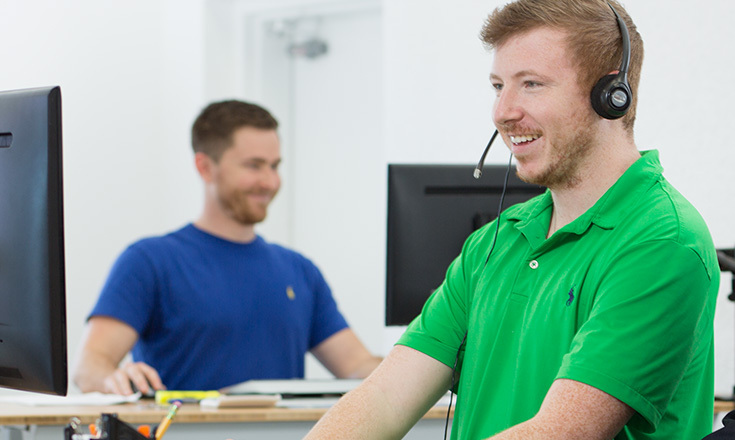 If you’d like to enjoy a higher level of customization, the Xdesk Exclusive Team is here to help. Since the beginning, Xdesk has been dedicated to giving customers the opportunity to fully personalize their desk. If you’d like to enjoy a higher level of customization, the Xdesk Exclusive Team is here to help. Every square inch of metal and wood and each fine detail can be customized. It’s how we bring dreams to life. And how we create something unique. Custom design your own standing desk to fit your office, space, and lifestyle. 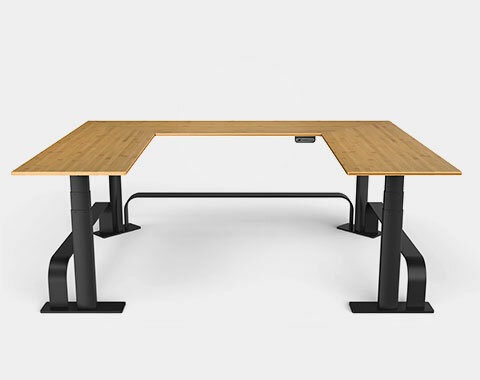 Available in your choice of either natural bamboo or solid aluminum, a custom Xdesk offers a spacious desktop area with up to 250% more surface area than a typical standing desk. Custom design your own desk to fit your office, space, and lifestyle. 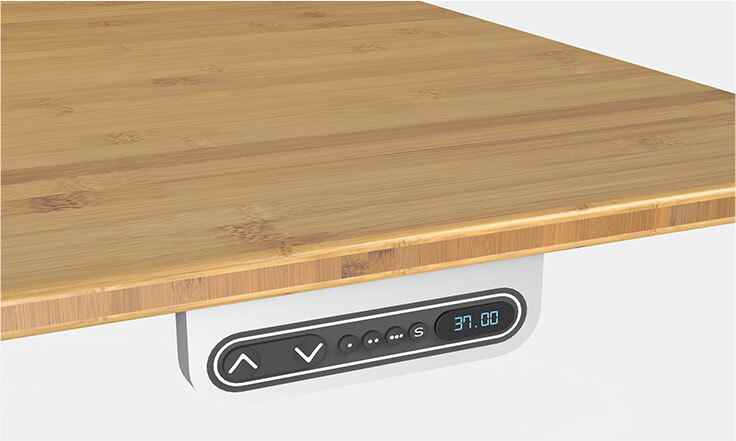 From the moment you touch the button, Xdesk begins and ends each controlled motion with an elegant glide. Each silky smooth transition appears effortless and controlled yet the desktop moves at an amazing 1.7 inches per second. Highly efficient and virtually silent, Xdesk adjusts 54% faster. The weight capacity figures speak for themselves. Xdesk Custom Series is conservatively rated to lift a remarkable 470 lbs. 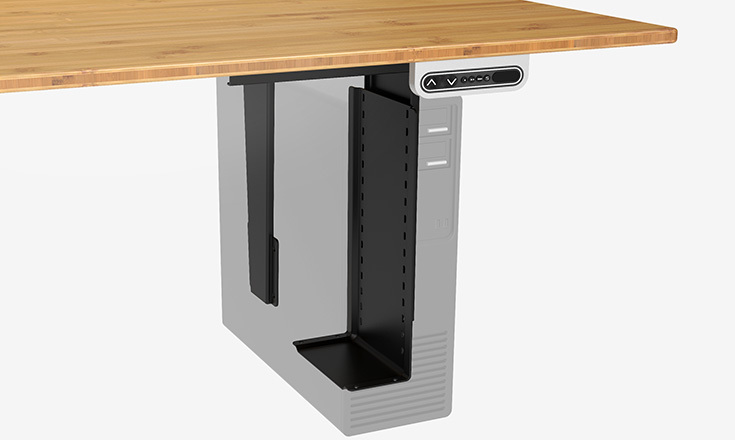 The Xdesk Custom standing desks are built for superior strength, stability, and speed. The frame starts with solid aircraft-grade aluminum and a ground up redesign. 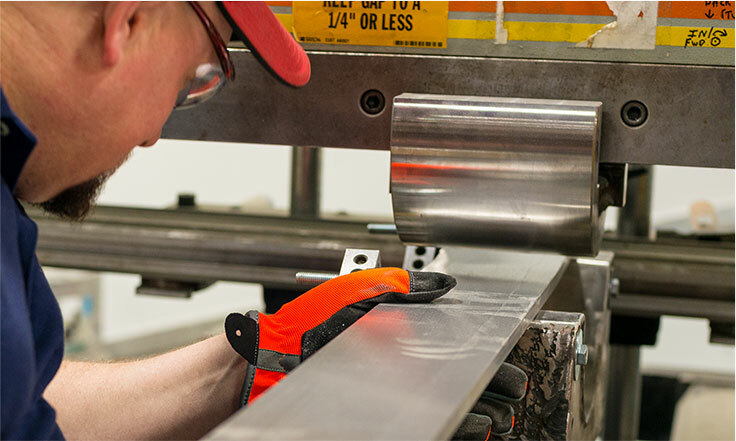 We are often asked why Xdesk chose aluminum when steel is much cheaper. That's because no other material in the world compares to aluminum when it comes to strength, sustainability and visual beauty. It has the highest strength-to-weight ratio of any metal, it is non-corrosive, and let’s face it, it looks awesome when it's brushed and anodized. Made possible by advanced safety protection, the 2S can move continuously at a single touch of a button. You no longer need to hold the button down to transition to your optimal height. Just program your desired height into the digital memory control panel, press and release the button, and 2s will transition to the new height in seconds. From the moment you touch the button, Xdesk begins and ends each controlled motion with an elegant glide. Each silky smooth transition appears effortless and controlled as the desktop moves at an amazing 1.7 inches per second. This best-in-class lifting speed is made possible by dual 18 volt DC motors and an advanced microprocessor controller. Both speed and proximity of each actuator are precisely measured and adjusted many times each second. The result is perfect harmony. Soft-start and soft-stop capabilities mean Xdesk will never experience jerky movements or clicking transition noises. Maintaining the Xdesk standard of seamless movement with the added weight of storage was top priority for our engineers. Internal software and hardware power the desk smoothly through its transitions as all-new internal Glide Pads reduce friction to ensure there are no distracting oscillations, vibrations or sounds. Thanks to soft touch convex and concave buttons, there's no need to interrupt what you're doing to change your position. Now adjustments can be made by feel. And once you've found that perfect height for sitting or standing, getting back to it couldn't be easier, thanks to three programmable memory buttons. A solid machined aluminum surround provides both strength and a touch of quality. Perfect for multiple users, a clear LED digital display lets you know the exact position. 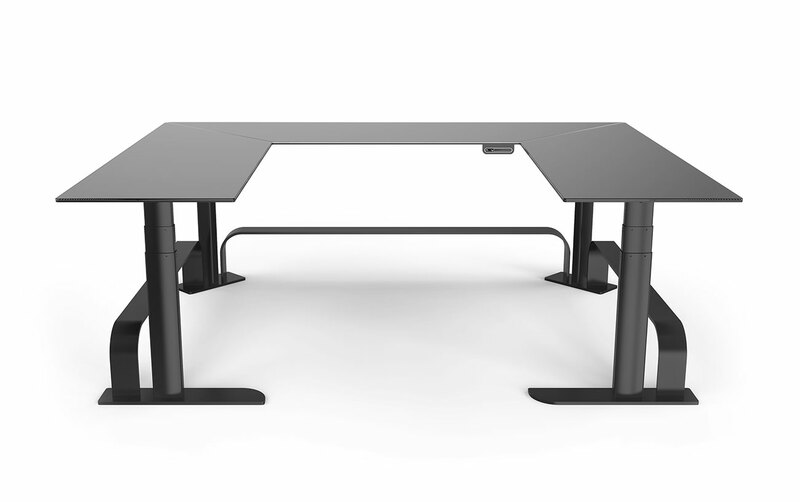 With 267 different positions, you and anyone lucky enough to borrow your Xdesk are sure to find the perfect height. For the engineers at Xdesk, a new desk design isn’t just about being more powerful and beautiful. It’s about achieving a new level of precision in safety. 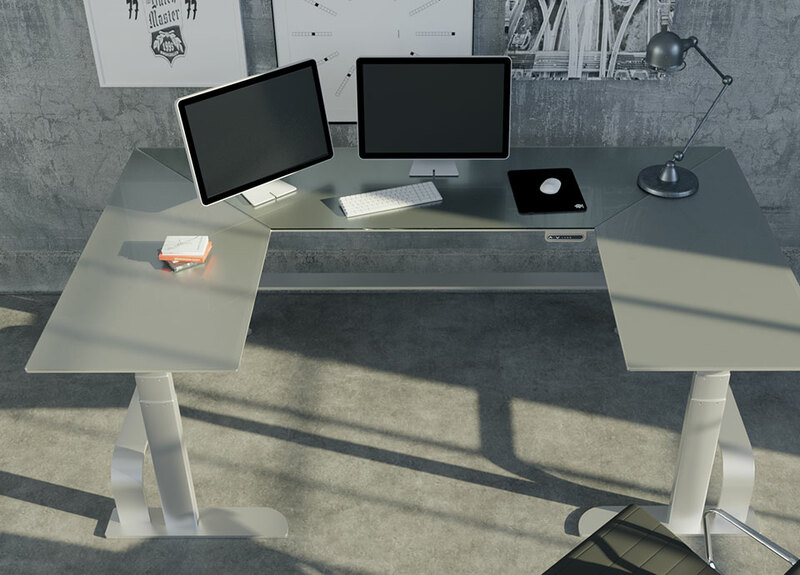 For an autonomously moving desk, an effective collision avoidance system is essential to user safety—a category in which Xdesk already excels. 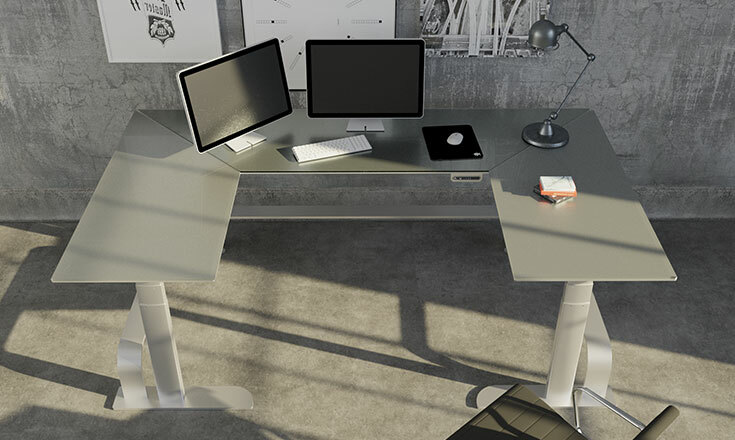 Xdesk engineers have developed Active Safety Protection (ASP), a revolutionary anti-collision technology. Advanced hardware sensors were integrated into the columns for more precise and reliable obstacle detection. The added hardware is more sensitive and responsive than software only systems. With both hardware and software at work, obstacles are quickly detected to stop movement within milliseconds of obstacle detection allowing the desktop to automatically reverse. With only the finest awe-inspiring materials, Xdesk looks beautiful and works beautifully. While we're certainly proud of the performance, we're equally proud of what you'll see when looking closer. Xdesk pushes the envelope with modern, sustainable materials. 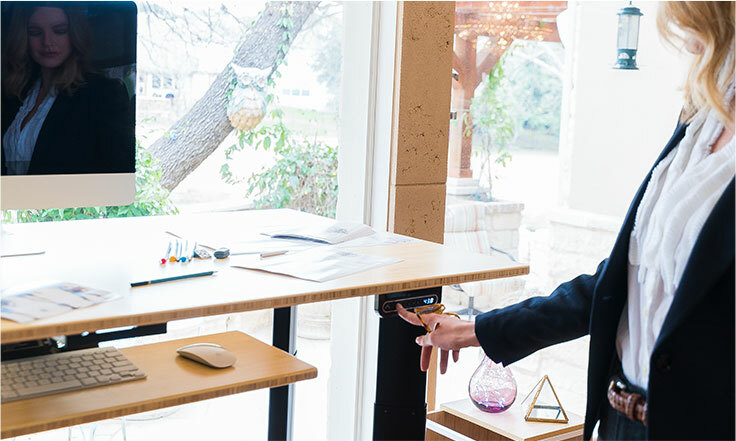 Xdesk is designed to have an impact on your health—not on the environment. Pressed wood/MDF and laminates often emit harmful toxins. From day one, Xdesk eliminated these across the board on all of its products. Xdesk continued to push the limits on sustainable materials, and eliminated all solvent-based paints. You’ll find genuine, honest-to-goodness quality materials. Each advanced powder coat finish is baked on in 400 degree ovens for increased scratch and wear resistance. For the ultimate in sophistication, choose anodized aluminum to allow the natural beauty & fine detail to shine through, even in black. A non-gloss finish available in either natural silver matte or black matte, anodized aluminum resists scratches and will never corrode, flake or peel. 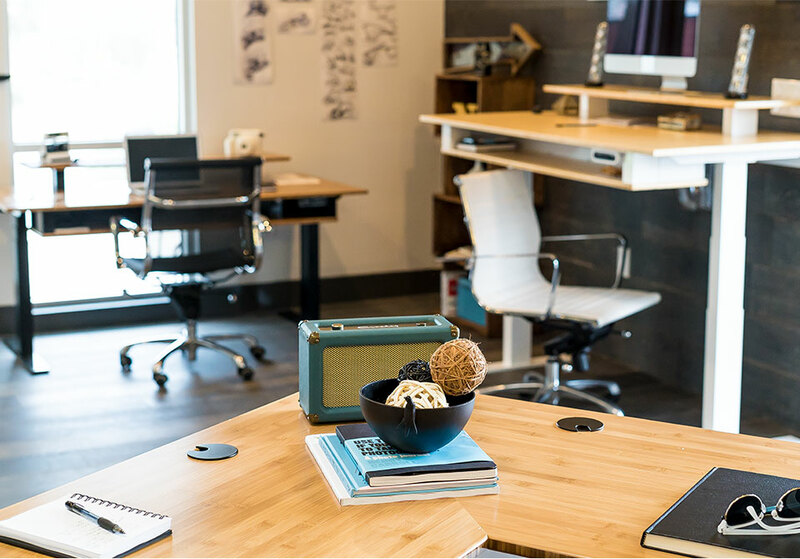 Driven by an obsessive attention to every detail, Xdesk Custom sets the standard for what all adjustable height desks should be: genuine, sustainable, and sophisticated. With an incredibly sleek design, nobody would ever guess what's hidden inside. 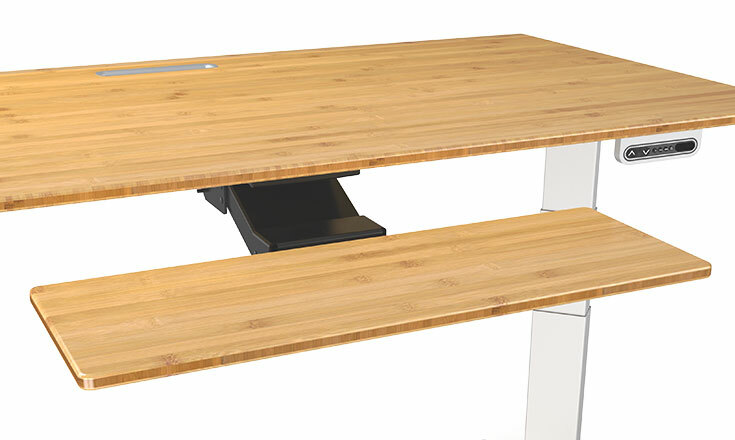 Xdesk Custom maintains its modern, even minimalist appearance while completely hiding its advanced lift system. 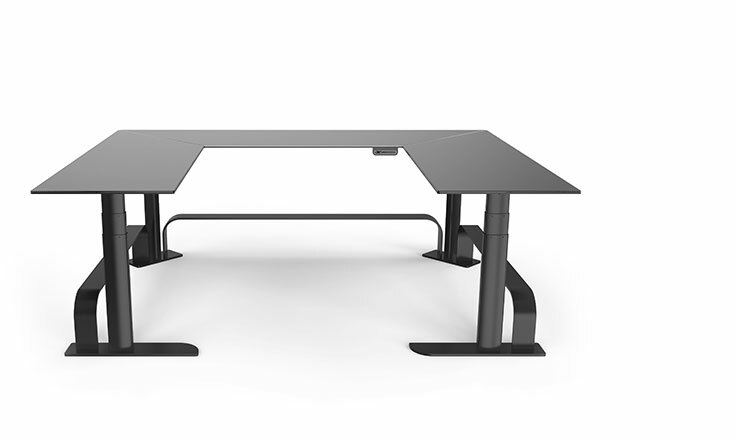 The new Custom Xdesk features more stability and more storage capacity than any electric desk before it. 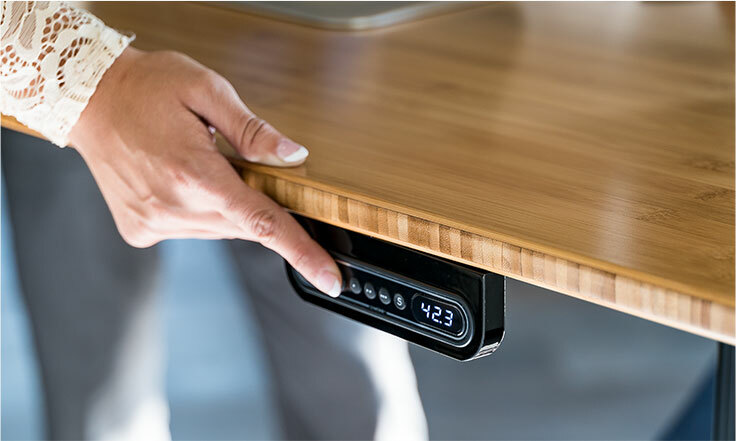 Each Xdesk features state-of-the-art, microprocessor-controlled DC motors that move the surface up and down in seconds—so smoothly that you won’t ripple your morning coffee and so quietly you won’t disturb your neighbors. Driven by an obsessive attention to every detail, Xdesk Terra 2S sets the standard for what all adjustable height desks should be: genuine, sustainable, and sophisticated. With an incredibly sleek design, nobody would ever guess what's hidden inside. 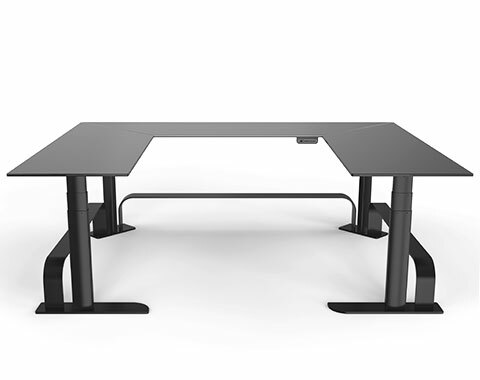 Xdesk Terra 2S maintains its modern, even minimalist appearance while completely hiding its advanced lift system. 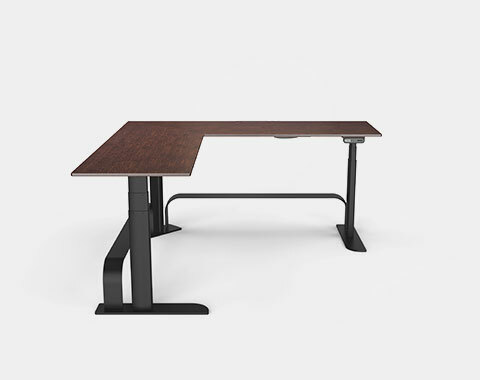 The new Terra 2S features a unique 45 degree column position, more stability and more storage capacity than any other dual column electric desk before it. 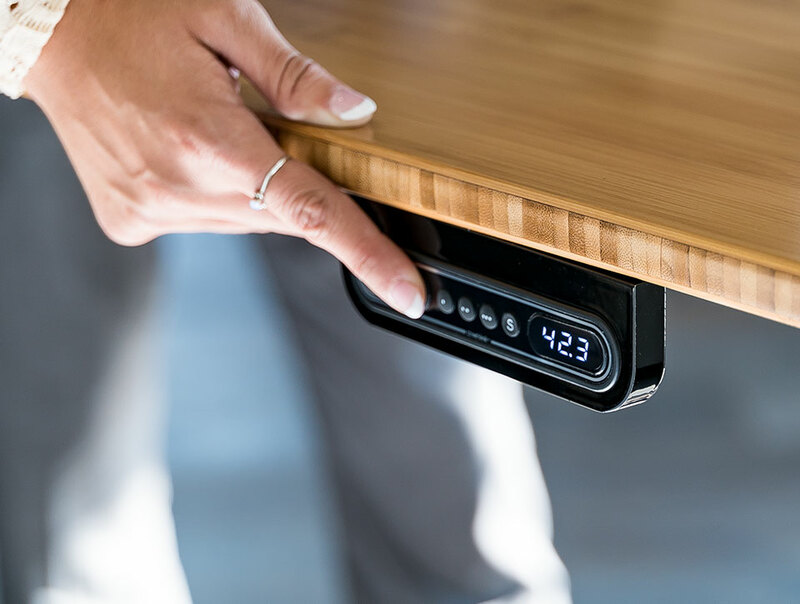 Each Xdesk features state-of-the-art, microprocessor-controlled DC motors that move the surface up and down in seconds—so smoothly that you won’t ripple your morning coffee and so quietly you won’t disturb your neighbors. Settling for “good enough” isn’t part of our mantra at Xdesk. Building off the success of the first generation Terra, our engineers have brought a new level of precision, power, and effortless speed to the Xdesk Custom Series. Xdesk makes hand-crafted custom Custom power-adjustable desks in a virtually unlimited number of sizes and styles only limited by your imagination. Looking for a custom Xdesk designed just for your office or space? No problem. Looking for a custom bamboo stain to match existing furniture? Done. The options are only limited by your imagination. Xdesk Custom Series is preassembled at the factory. Only final assembly is required. Preassembly allows the user to remove from packing and complete final assembly in approximately 45 minutes. Xdesk uses the best tcarriers in the business to make sure your Xdesk gets to you on time and in good condition. Fed Ex is used for desks up to 70 inches wide. For larger desks, we use home delivery service through major truck lines. You will have the option of picking up your Xdesk at a local dock, or making an appointment to have Xdesk delivered to your home. Xdesk will gladly ship products worldwide to most international destinations. The Xdesk Online Store ships within the United States of America and Canada. If you wish to get an international shipping quote on any of our products, please call (00+1) 512-212-7758 or use our international shipping form to obtain a shipping quote. With residential large desk deliveries (over 70 inches wide), the driver will typically bring the desk to the end of the driveway or front door of the delivery location. The driver cannot typically bring the crate inside your delivery location. Depending on the shipping company, they may remove the item from their truck. With commercial deliveries, the driver may bring the item inside your place of business. Inside delivery typically costs an extra $150. 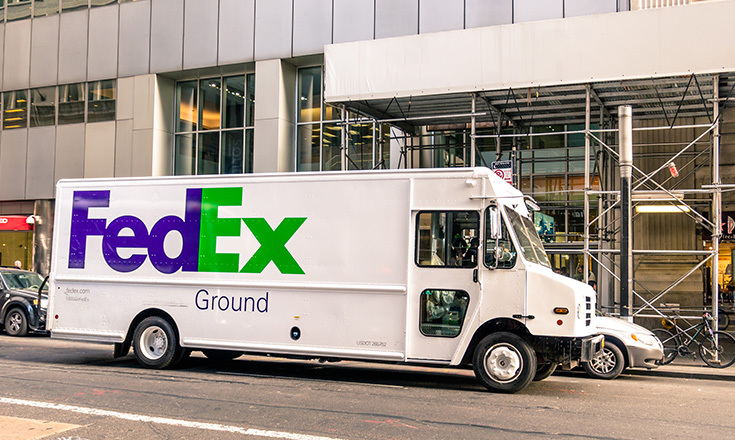 Extraordinary delivery requirements such as a multi-level building may require additional delivery charges. 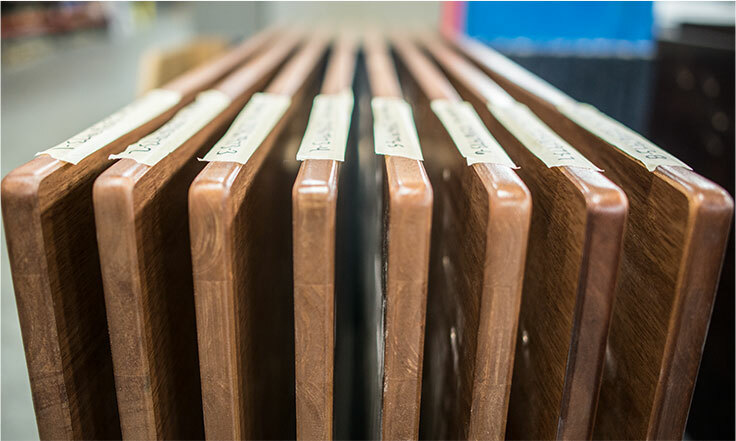 Each Xdesk is custom manufactured in the order it is received. The lead time for manufacturing is indicated at checkout and varies by product. Once shipped, the actual delivery date of your order can be affected by events outside of our control. Shipping and transit times may vary. In most cases, add 2-5 days for transit. At Xdesk, we think knowing your desk will stand with you through every day builds trust and confidence. That’s why your Xdesk and its motors are backed by a best-in-class, 5-year limited warranty. 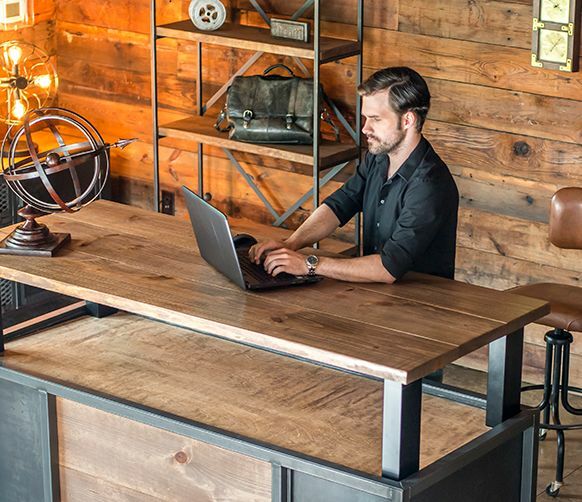 All Xdesk standing desks are designed and hand-crafted in Austin, Texas. In addition to offering the best in class warranty, we are so sure you will love your Xdesk, we offer a 30-Day Satisfaction Guarantee. Try a Xdesk for 30 days risk free, and in the unlikely event you are not happy with your Xdesk for whatever reason, we invite you to return it. You may return your undamaged Xdesk in its original condition with the receipt and packing for a full refund of the product cost within 30 days of purchase. 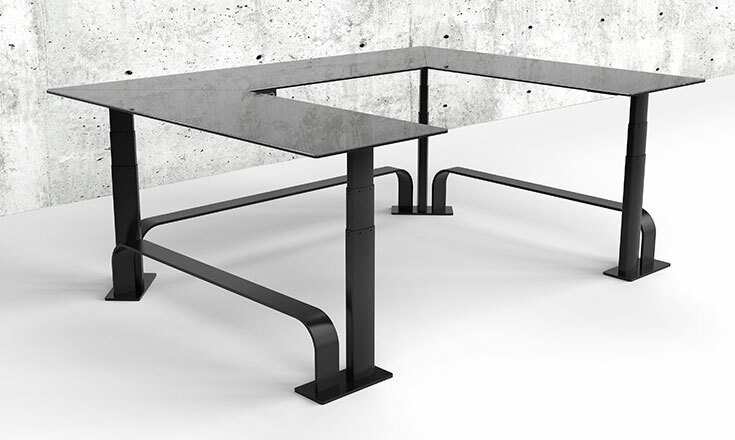 While the Xdesk Custom Series is designed for maximum stability without a crossbar, the additional rigidity provided by the Artisan Bar is undeniable. No engineer can escape the laws of physics - adding a crossbar makes any design even stronger. 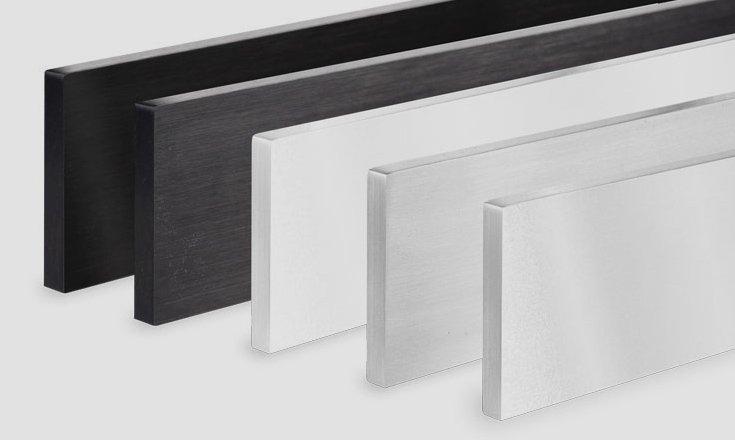 Maintaining the form and function philosophy, the Artisan Bar is sculpted from half-inch thick solid aluminum. Each artful bend in the aluminum is made with 60 tons of force. The Artisan Bar is positioned for maximum effect - low near the floor and out of the way. The end result is a one-of-a-kind sculpted aluminum beauty. The brushed aluminum catches the reflection of lights, delivering a finishing touch like no other. For the first time ever, autonomous movement is now standard in every 2S. New collision-avoidance hardware and software allow the 2S to move continuously at a single touch of a button. You no longer need to hold the button down to transition to your optimal height. Just program your desired height into the digital memory control panel, press and release the button, and 2s will transition to the new height in seconds. With only the finest awe-inspiring materials, Xdesk looks beautiful and works beautifully. While we're certainly proud of the performance, we're equally proud of what you'll see when looking closer. Xdesk pushes the envelope with modern, sustainable materials like natural bamboo and recycled aluminum, pioneering the development of environmentally friendly materials. Bamboo is the most easily replenished and sustainable woody plant on earth. Growing up to 39 inches in a single day, bamboo is the fastest growing woody plant on earth. We hand select the highest-grade premium bamboo and then CNC machine each desktop to give it a smooth contoured edge so you can rest your forearms and wrists comfortably during long hours of work or play. Each desktop is finished with a 100% solid, ultraviolet light cured finish. This solvent-free and ultraviolet light cured finish protects the surface while bringing out the natural beauty of the bamboo The calming, natural tones of Bamboo deliver an ageless beauty to any space. This gorgeous wood looks a lot like oak but is highly sustainable. After 30 years of latex production, rubber trees must be replaced with new ones. Previously, the felled plantation rubber tree would be burned. Xdesk recycles the felled rubber tree into desktops. Rubberwood is a sustainable hard wood with a warm, beautiful grain. Each desktop is finished with a solvent-free and UV-cured durable finish that protects the surface and brings out the beauty of the grain. WoodFree™ is shaking up the industry with an innovative new product: straw-based desktops. This creative alternative to cutting down tracts of trees recycles leftover agricultural products that would otherwise go to waste. Wheat farmers were burning fields of stalks after the yearly wheat harvest. It was the perfect opportunity to work with farmers to buy their waste product. The hard and durable desktop features an eye-popping design that looks a lot like granite. WoodFree is catching on quickly because its sustainable yet doesn’t compromise on price or performance. Ten WoodFree desktops save one tree. Recycled aluminum is handcrafted into modern designs that offer distinction and simplicity, blending seamlessly with today's technology. Brushed and anodized aluminum delivers a strength, beauty and sense of quality not available in any other material on earth. Although solid aluminum is 3-4 times more expensive than steel, the decision to use this superior material was an easy one. Aluminum has the highest strength-to-weight ratio of any metal, is non-corrosive and looks amazing in a variety of colors. Recycled aluminum uses just 5% of the energy required to make new aluminum, with no difference in quality or strength. And since Xdesk is aluminum, it's much more likely to be recycled and reused again at the end of its long and productive life. Each aluminum frame is available in anodized or powder coated and in brushed aluminum or solid colors. Brushed aluminum offers a distinction and simplicity that blends seamlessly with this age of technology. But some settings simply call for the purity of white or the boldness of black. Xdesk uses dry powder coating, an advanced environmentally friendly color process that delivers a finish harder and tougher than paint. Powder coating is a clean process that eliminates the "off-gassing" that may continue for months after a painted desk enters a home or office. 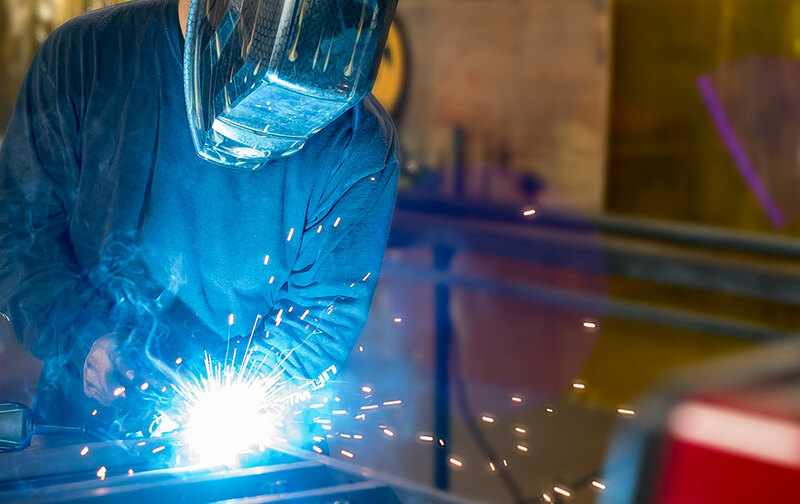 Powder coating is applied as a free-flowing dry powder that is cured in 400-degree ovens to form a "skin" that is harder and tougher than paint. And unlike paints, powder coating contains no solvents and releases zero to very little VOCs into the atmosphere. 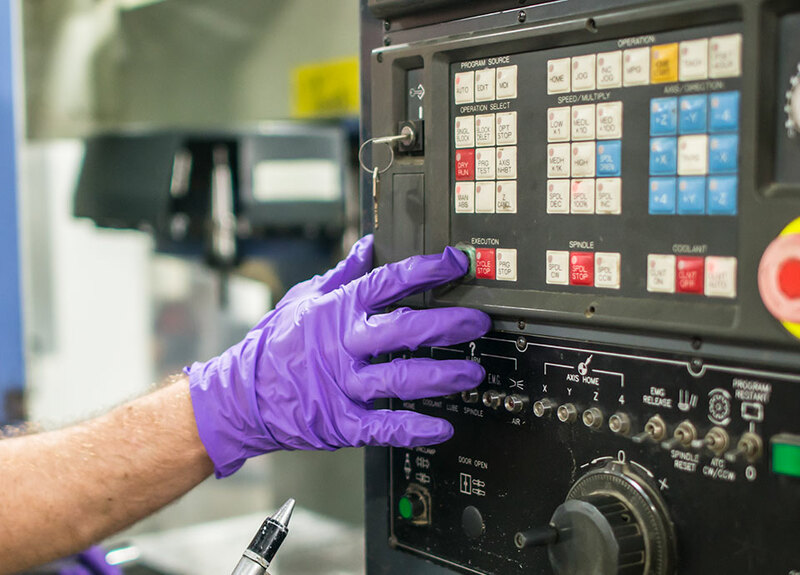 Air from the coating booth is so clean that the air can be returned to the facility. Up to 98% of overspray that does not adhere can be reused, virtually eliminating all waste. While some prefer natural beauty, sometimes we just need a little color. The easy way out would be to use solvent-based paints that contain volatile organic compounds, or VOCs. Solvent-based paints that contain VOCs may cause watery eyes, sneezing, coughing, and in some cases even an asthma attack. To keep Xdesk clean and pure, an advanced technology called powder coating was chosen. Xdesk has a long commitment of selecting natural, sustainable and recycled materials. Bamboo is the most easily replenished and sustainable woody plant on earth. 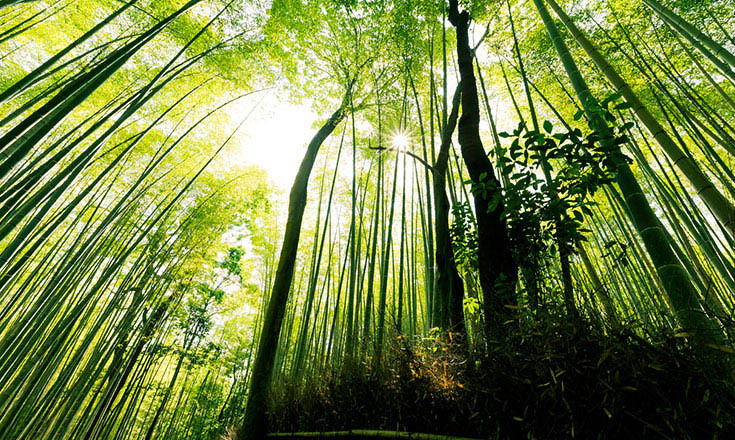 Growing up to 39 inches in a single day, bamboo is the fastest growing woody plant on earth. Aluminum is the most abundant metal in the earth's crust. 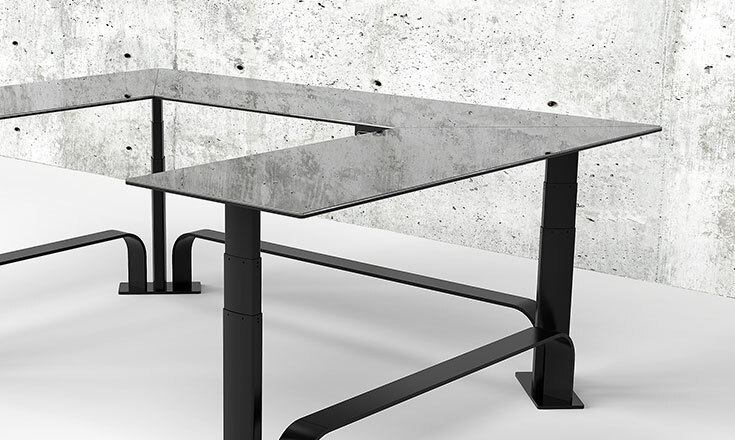 Chosen for all Xdesk frames and also the top surface of the Xdesk Air, recycled aluminum is highly sustainable. Aluminum has an amazing lifecycle. 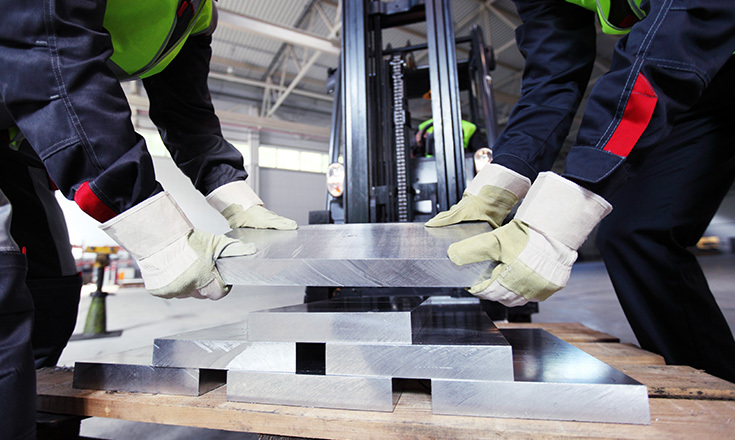 Consider this: over two-thirds of the aluminum ever produced is still in use today. Recycled aluminum uses just 5% of the energy required to make new aluminum, with no difference in quality or strength. And since Xdesk is aluminum, it's much more likely to be recycled and reused again at the end of its long and productive life. Rubberwood (Plantation Oak) offers the beauty of Oak without the negatives. After 30 years of latex production, rubber trees must be replaced with new ones. Previously, the felled plantation rubber tree would be burned. Xdesk recycles the felled rubber tree into Plantation Oak desktops. Aluminum is the most abundant metal in the earth's crust. 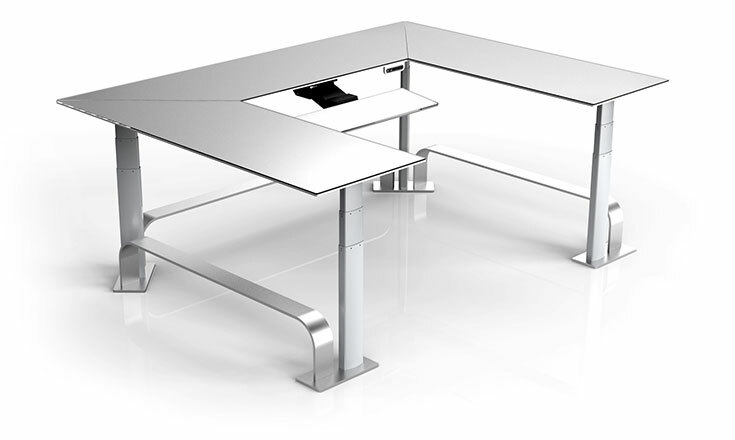 Chosen for all of Xdesks' frames and also the top surface of the Xdesk Air, recycled aluminum is highly sustainable. Aluminum has an amazing lifecycle. Consider this: over two-thirds of the aluminum ever produced is still in use today. The greatest environmental health challenges facing the desk and furniture industry today is the presence of formaldehyde. In homes offices, the most significant source of formaldehyde are pressed wood products made using adhesives that contain urea-formaldehyde resins. Formaldehyde is a known human carcinogen associated with cancer. 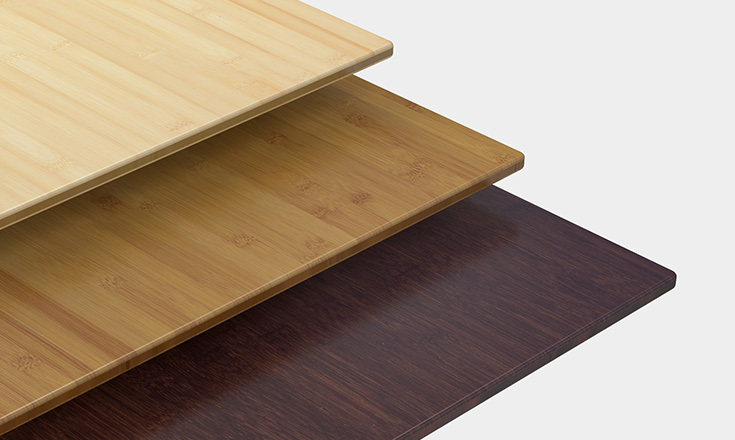 The vast majority of office furniture uses pressed-wood products, laminate, veneer or MDF. Although uncontrolled particle board and MDF can be harmful to people and the environment, they are commonly found in more than 85% of furniture products. 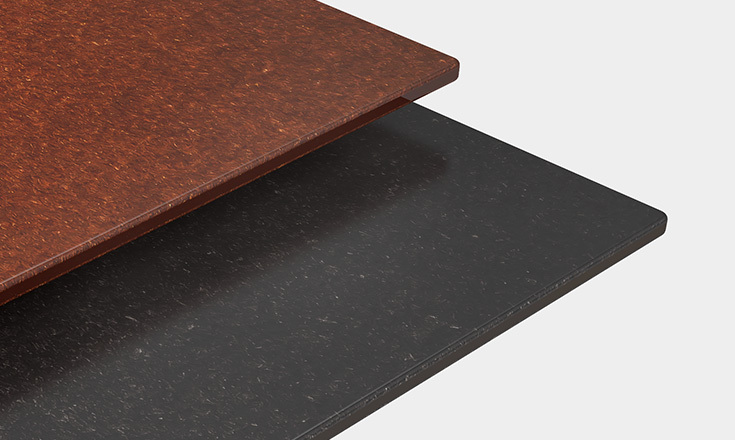 Xdesk selects all materials carefully selected to meet the highest quality and environmental standards. Not only is every product we sell free of formaldehyde and other harmful toxins, we have also eliminated the use of solvent-based paints, putting Xdesk years ahead. Xdesk is committed to ensuring that both our customers and our workers are safe. 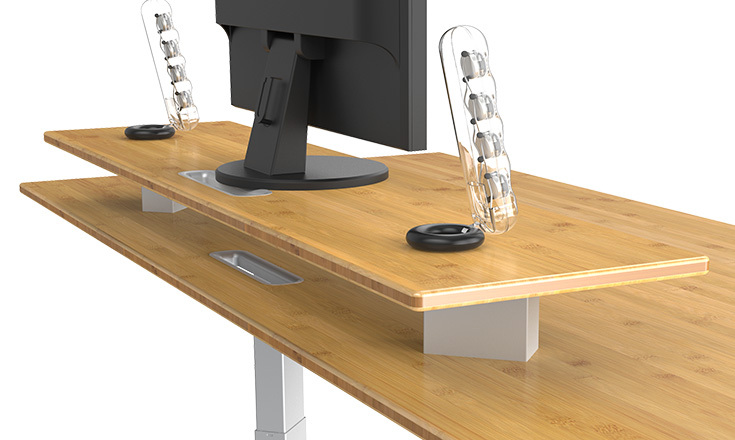 US based finishing allows for tight control and monitoring of how Xdesk is manufactured. Size is only limited by your imagination. Personalize & customize for your unique space and style. Since the beginning, Xdesk has been dedicated to giving customers the opportunity to fully personalize their desk. If you’d like to enjoy a higher level of customization, the Xdesk Exclusive Team is here to help. Every square inch of metal and wood and each fine detail can be customized. It’s how we bring dreams to life. And how we create something unique. Press a soft touch button and watch Xdesk Custom glide effortlessly from sitting to standing height in seconds. With over 200 possible sitting and standing positions, the perfect ergonomic position is just seconds away. Highly efficient and virtually silent, Xdesk adjusts 54% faster than any desk before it. Each silky smooth transition appears effortless and controlled as the desktop moves at an amazing 1.7 inches per second. This best-in-class lifting speed is made possible by dual 18 volt DC motors and an advanced microprocessor controller. Both speed and proximity of each actuator are precisely measured and adjusted many times each second. The result is perfect harmony. Breathing Life Into the Desk. A desk should be much more than metal and wood. It should evoke movement while adding warmth only possible with genuine materials like natural bamboo and aluminum. Seeing Xdesk for the first time should invoke feelings you get from seeing a work of art. Xdesk delivers a confident demeanor and showcases an outward expression of strong character. A tradition of old world craftsmanship is a critical element in the artistry. Breathing life into the desk creates an emotional bond between owner and their desk. From the moment you unwrap your Xdesk, you’ll sense our passion and commitment to the art of creating desks with soul. Its sculpted beauty and shifting reflections as it catches the light creates an irresistible urge to enjoy it. There’s more to creating a desk with soul than simply sculpting the physical form. We seek something that exudes vitality. 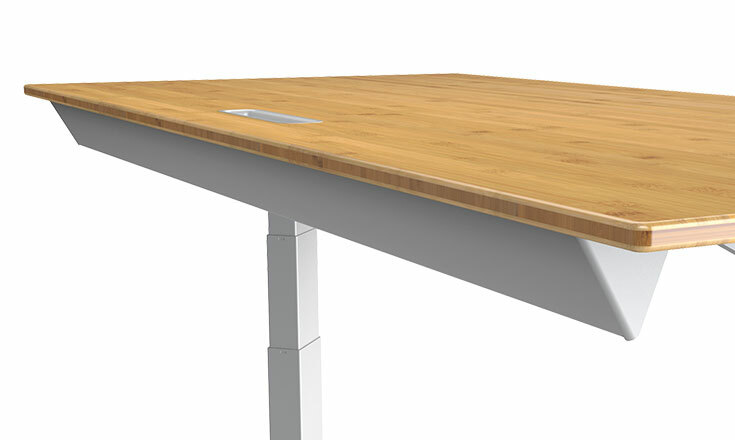 Xdesk selects only sustainable materials like natural bamboo, Rubberwood, WoodFree and recycled aluminum. Recycled aluminum uses just 5% of the energy required to make new aluminum, with no difference in quality or strength. Aluminum has the highest strength-to-weight ratio of any metal and can be anodized to provide a beautiful yet hard scratch resistant surface. Life is best when filled with great design. Beyond useful. These design objects give meaning to a space. And a spark to one’s emotions. Xdesk delivers a confident demeanor and showcases an outward expression of strong character. A character that’s simply unyielding. An uncompromising declaration of individuality. You can see it. You can feel it. Xdesk is a loyal testament to the craftsmanship and values of days gone by. In a world where fewer and fewer things are made by people that like making, we’re excited to make furniture for you the same way as our forefathers. 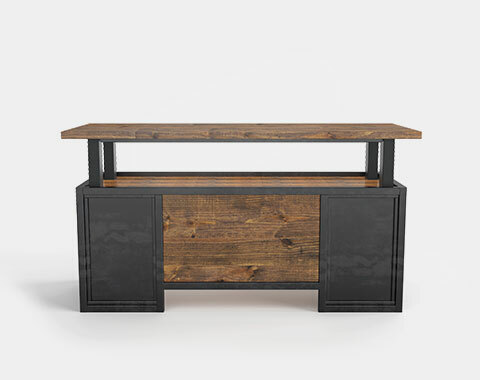 Set near the beautiful Texas hill country, Xdesk meticulously makes each piece by hand and with obsessive attention to detail, even in areas never seen. 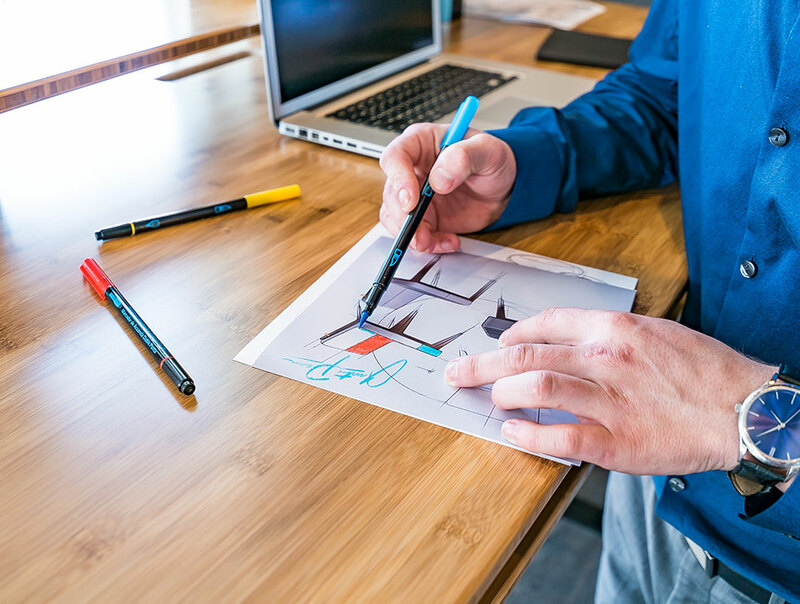 Regardless of the latest fashions and short-lived trends, embodies an understanding of a few simple design principles that make recognizable at first glance. Each desk is made from solid aluminum or steel, alluding to a time when furniture was built to last. In the refinement of the desk, Xdesk left no stone unturned. Simply press one of the soft touch buttons and Xdesk glides smoothly and silently from the sitting to standing position in seconds. Transitions are so smooth you won’t ripple your morning cup of coffee and so quiet that no one will notice. The state-of-the-art microprocessor starts each movement slowly and gently glides to a stop when complete. No jerking. No jolting. All-new internal glide pads reduce friction to ensure there are no distracting oscillations, vibrations or sounds. There’s no bulk or clutter you’d expect in a power adjustable desk. 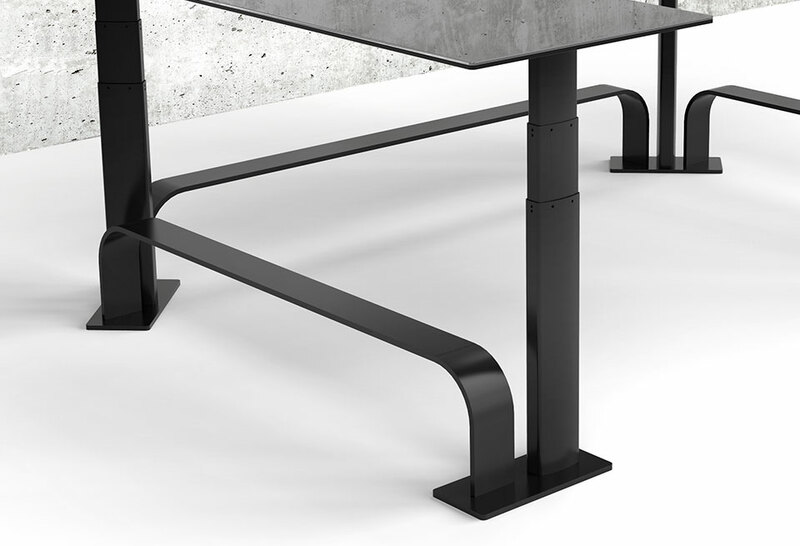 While other desks struggle to hide their many wires, motors, and gears, Xdesk engineers cleverly hid the motors inside the lifting columns eliminating the bulky motor housing. Designed for form and function, Xdesk is dynamic without being extravagant. Modern, yet understated. With the right equipment, there’s nothing to stop you from taking your goals by storm. The Custom Series was designed with new user-centric solutions such as a split level desktop. Xdesk offers over a dozen options that help you get the most out of your day. Integrated storage and shelving are designed to keep your most important tools organized and close by. Harmon Kardon sound systems and power management with front facing USB and audio ports help you seamlessly connect. 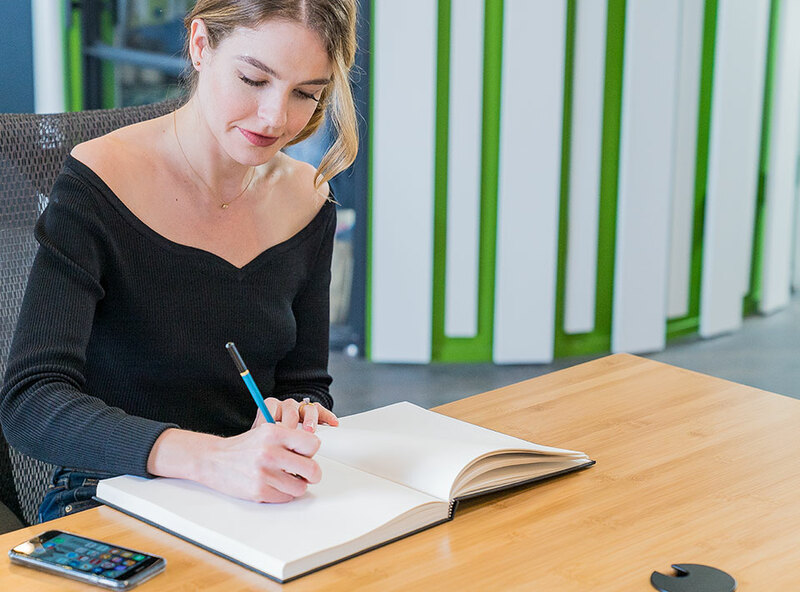 Designed to integrate with your PC or Mac, Pulse tracks your calories, time spent sitting and standing, and will even remind you to sit or stand. Introducing the all-new Loft second space for your desktop. The aluminum and bamboo perfectly coordinate with Xdesk while increasing the surface area of your desktop by a remarkable 29%. This massive platform positions your monitor at the ideal ergonomic height, and is large enough to accommodate other accessories like speakers while freeing up valuable desktop space. Loft features an oversized grommet hole trimmed in matching aluminum to keep all your cables under control and neatly organized. Nest allows you to keep your most important tools close without taking up valuable space on your desktop. The optional Nest storage space adds up to a massive 2,448 cubic inches of quick-access space below your desktop. Store your favorite electronics, tools, and supplies within arm’s reach while maintaining the clean, uncluttered look of your desktop. Add the Nest compartment for additional storage space right where you need it. The NextSpace™ keyboard platform achieves perfect wrist placement. Based on years of ergonomic research, the platform quickly adjusts by hand on both vertical and longitudinal axes. NextSpace accommodates any sitting or standing position so your wrists are never strained or over extended. 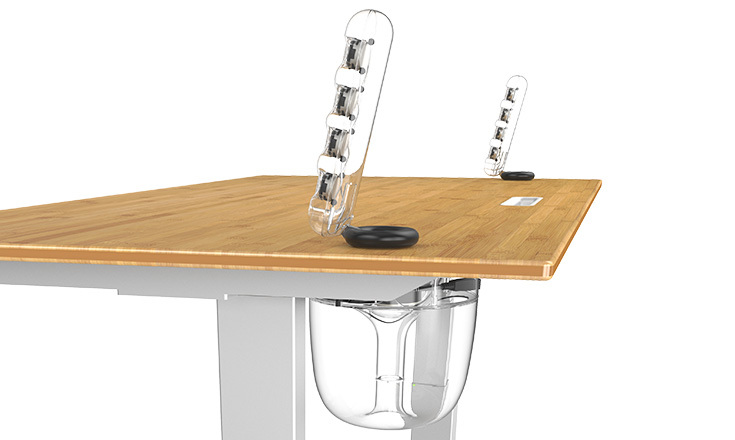 All complicated levers are hidden from view to maintain the clean design of Xdesk. Customized to match your aluminum or bamboo desktop, NextSpace is the secret to ideal ergonomics. 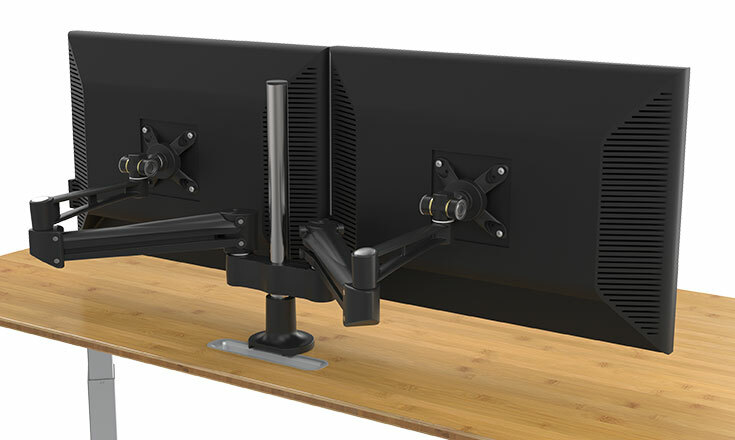 Xdesk Monitor Arms allow a dynamic monitor setup. The monitor arms swivel 360 degrees and move up to 20 inches in either direction while freeing valuable space on your desktop. Adjust the Monitor Arms according to your specifications to maintain perfect sitting or standing position. Available in single or dual, the monitor arms seamlessly work with all Xdesk features to create the ideal ergonomic workspace. The Cable Management Vanity Cover is a superior cable concealment system. With the Vanity Cover in place, every cable and wire is fed into an aluminum raceway that seamlessly hides them from view. 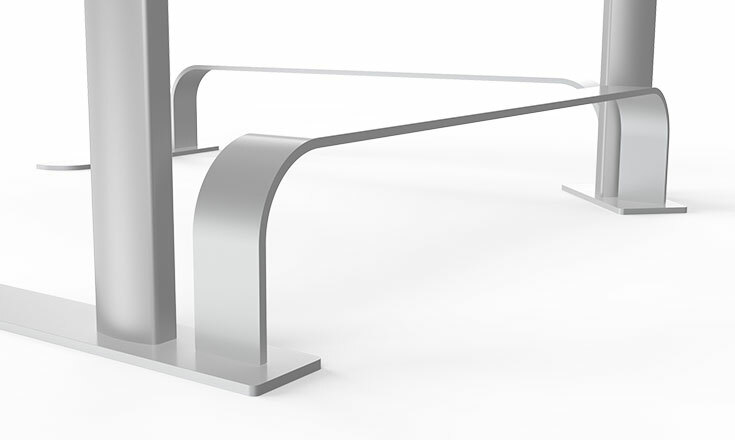 Maintaining the sophistication of Xdesk, the Vanity Cover is custom-fabricated from recycled aluminum and then finished to match the aluminum frame. Simplify your workspace and restore order to cable chaos. The Harman Kardon® Integrated Sound System uses stunning transparent, minimalist design that catches your eye without being a distraction. The down-firing powered subwoofer is installed underneath the Xdesk, out of the way and off the floor. Adjustable satellites allow freedom of movement as with Xdesk, and include easy to reach touch volume and mute controls. The result is a powerful sound system that goes beyond the highest standard, to deliver a sound quality so precise that it seamlessly integrates with the Xdesk. The three piece 2.1-channel multimedia system features a down-firing powered subwoofer, eight full-range transducers, and 40 watts of clean amplification. 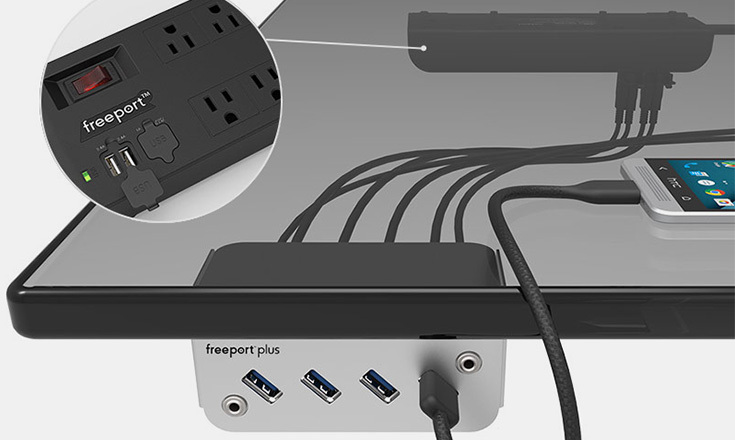 TThe Freeport Plus offers all the advantages of our Freeport PowerDock, and adds a convenient front panel that brings 4 configurable high-speed USB ports and 2 standard audio jacks within easy reach. Save your desk and floor space while adding a clean, organized look to your work area. 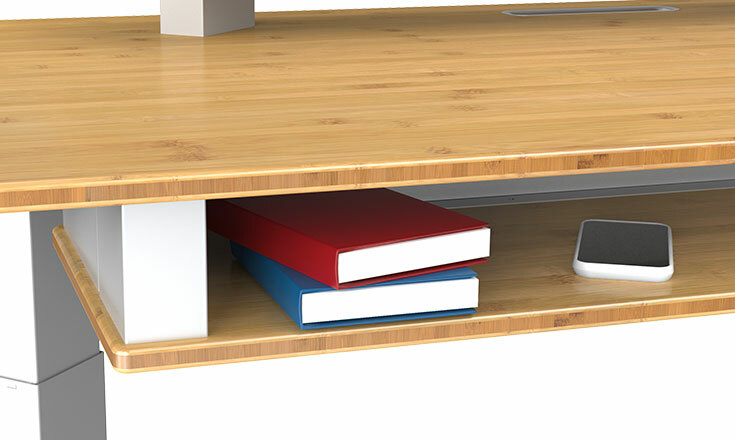 The Xdesk Connect’s space-saving design reduces clutter while providing convenient access to rear CPU ports. Not only is it a great organizational tool, but elevating your CPU reduces internal contamination and extends equipment life. Backed by science, the Xdesk anti-fatigue standing mat helps you to stand comfortably for long periods while minimizing discomfort and fatigue. The secret to long hours of comfort is a secure, stable footing combined with a unique energizing responsiveness not found in overly soft mats that allow the foot to pronate or supinate unnaturally. 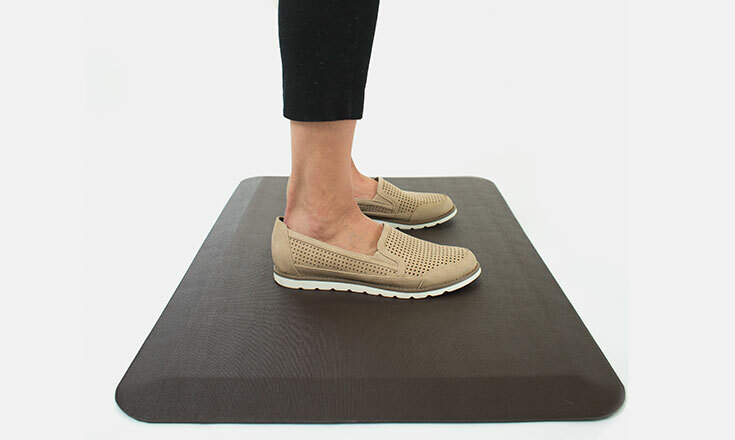 Early in our research, we learned there are three key factors that are most important when selecting a standing mat: comfort, support, and durability. Not only did our standing mat have to be soft and cushy, it needed to provide outstanding support to encourage standing over sitting. The Artisan Bar: Artful Stability. While the Custom Series is designed for maximum stability without a crossbar, the additional rigidity provided by the Artisan Bar is undeniable. No engineer can escape the laws of physics - adding a crossbar makes any design even stronger. Maintaining the form and function philosophy, the Artisan Bar is sculpted from half-inch thick solid aluminum. Each artful bend in the aluminum is made with 60 tons of force. The Artisan Bar is positioned for maximum effect - low near the floor and out of the way. The end result is a one-of-a-kind sculpted aluminum beauty. The brushed aluminum catches the reflection of lights, delivering a finishing touch like no other. The latest addition to Xdesk is the Artisan bar. Seeing an Artisan in person will likely invoke feelings you get from seeing a work of art. What makes the patent pending design so unique is the sculpted aluminum and shifting light reflections as the brushed aluminum catches the light. Our clients have always had a personal connection with their NextDesk. Pulse™ represents a new chapter in this relationship. 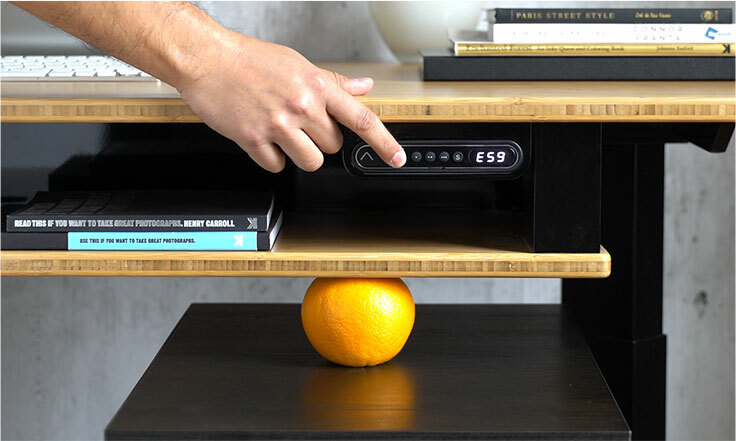 It’s the most personal desk we’ve ever made because it’s the first one designed to communicate with you. Pulse seamlessly integrates with our line of dynamic sit-stand workstations to create a comprehensive fitness and productivity suite for the workplace. The simple, user-friendly interface auto-syncs with any PC or Mac to allow users to record and analyze personal stats in real-time. Pulse helps you discover trends in workplace fitness behaviors. It’s easy to set goals and reminders, inspiring you to reach for new personal bests. Pulse is like having a personal trainer stationed at your desk, collecting personal stats and nudging you to work hard to reach your goals. Explore 12 design-conscious models that are destictively different. Every Xdesk model exudes fascinating appeal, setting them far apart from every other standing desk. With a delightfully eclectic design and an authentic independent spirit. The all-new 2018 Xdesk models bring second generation patent-pending technologies to life. Xdesk users now enjoy more choices and more user-centric soluctions than ever before. You'll see how our Texas factory designs with passion to make a desk with soul. © 2018 Xdesk.com - All rights reserved.